Of who she had been. No one noticed she had gone. To fit her life more comfortably. Who Loves the Girl with the Dancing Black Eyes? Have you seen the girl with the dancing black eyes? An exuberant bundle of fun. Who provides for the girl with the dancing black eyes? What cost the torn red dress patterned with white? Abandon safety and pride to a willing stranger? And gentle tugs at their clothes? Who cares for the girl with the dancing black eyes? Who pulls back her fringe with elastic hair band? And notices should she wander? As she dances over rubbish strewn paths? 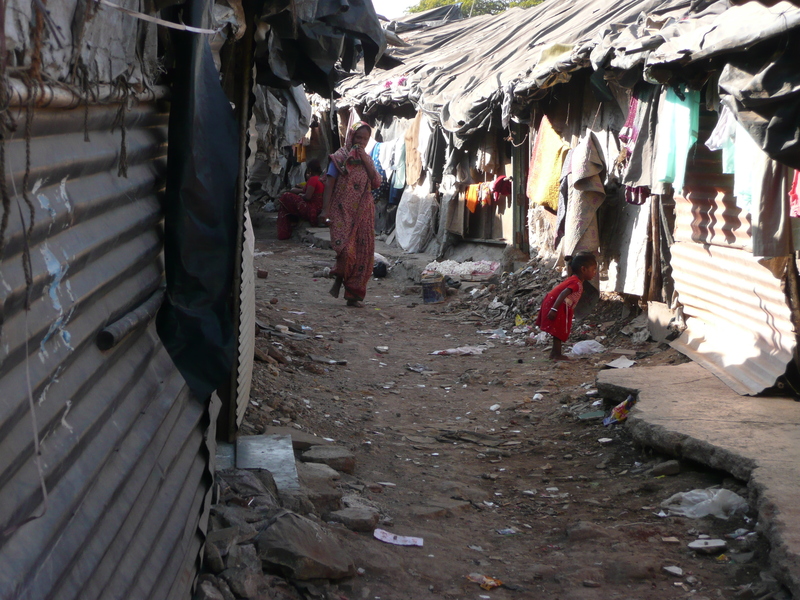 When we were in Mumbai, David visited the surrounding slums to see some of the work that Tearfund is doing. I was ill and stayed in the hotel room but when he returned, I could see from the tension in his face that he had seen some sad sights. As he carefully removed his clothes and sealed them into a plastic bag, I could guess at the hygiene standards in the slum. We then looked at his photographs. 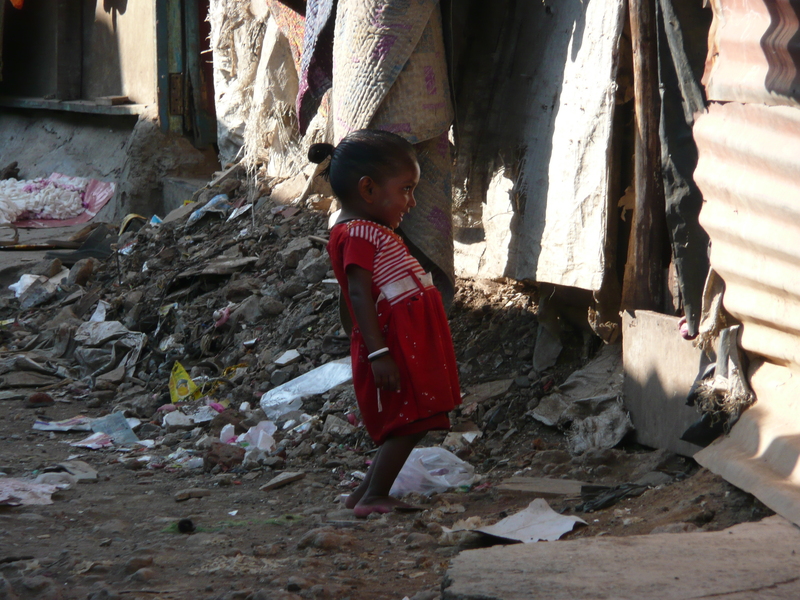 He had taken several of a ‘street’ in the slums and there was the little girl. We have no idea who she is, but she is clearly having a laugh and teasing someone inside the make-shift house. She is laughing with her whole being. Something about her tugged at my heart. Every fibre of my maternal being wanted to take her home, wash and dress her and take her to school. Clearly it was more appropriate to instead give money to a charity that could improve her situation in her own home but I cannot forget her. She is the screen saver on my computer and reminds me that when I think life is hard, I do not really know what ‘hard’ is. 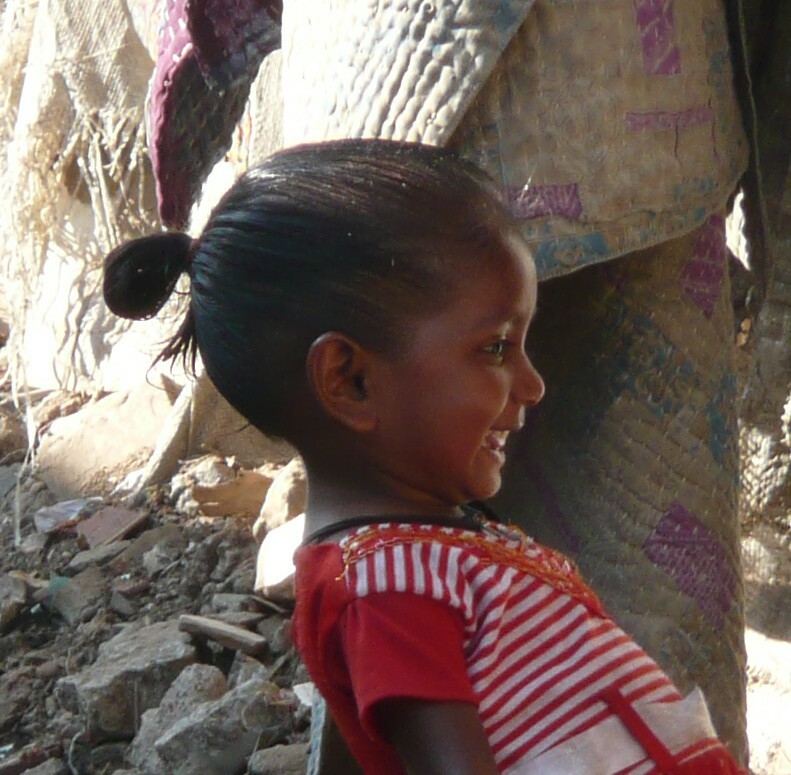 When I raise money to be used in India, it is her laugh that motivates me. As we walked to the station. And the prayer you would be safe. Help to stop child trafficking. See http://www.tearfund.org for more details.